Another year means another call to the hall for the game's greatest. 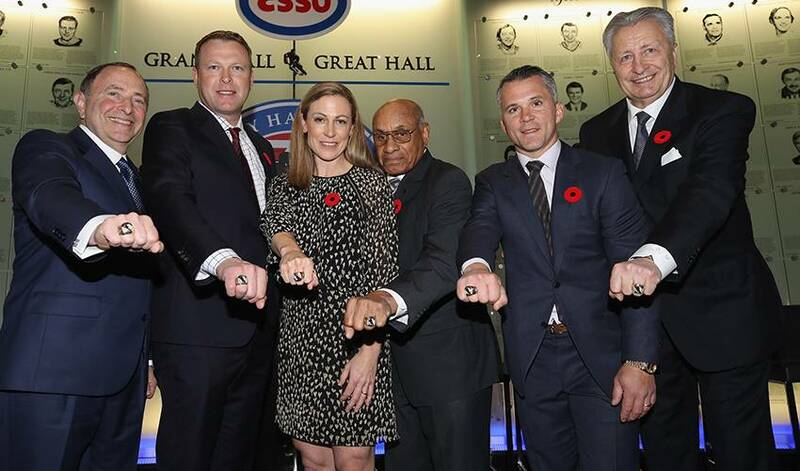 Monday marks the induction of former NHL players Martin Brodeur, Martin St. Louis, and Willie O'Ree – who will officially be enshrined Monday in the Hockey Hall of Fame alongside Gary Bettman, Jayna Hefford, and Alexander Yakushev. From inspiring rule changes to "showing them" and to paving the way for others, Brodeur, St. Louis, and O'Ree, have left undeniable impact on the game. Terry Sawchuk, Patrick Roy, and with his 552nd win it was – and likely ends at Martin Brodeur as the winningest goalie in NHL history. Before he was done, Brodeur accumulated 691 wins at hockey's highest level for a mark we can safely call untouchable – and same goes for his 125 shutouts. Though many great netminders preceded him, the native of Montreal changed the game for goaltenders. Officially titled, "Restrictions on Goalie Handling the Puck" in 2005, it was unofficially dubbed the "Brodeur Rule" as the trapezoid became synonymous with the goaltender whose ability to handle the puck was unparalleled. Though he may not have been a fan of the change, it bore little to no significance on Brodeur's eventual legacy and achievements. The four-time Vezina Trophy winner won two of his awards after the rule was brought into effect – and his fifth and final William M. Jennings Trophy. Prior to being named to the hall, Brodeur was named among the NHL's top 100 players (as decided by the NHL as part of their centennial celebrations) after having his No. 30 retired by the New Jersey Devils in 2016. Undrafted an undersized, the odds were seemingly stacked against Martin St. Louis to make it in the NHL. These were the words of France St. Louis to her son – a mantra that Marty would draw support and inspiration from along his quest to make it in the NHL that he revealed in an emotional first-person account written for The Players' Tribune. However, he didn't just 'make it'. St. Louis became one of three players in the NHL listed at 5’8” or shorter to record over 1,000 points in the league, joining Henri Richard and Theo Fleury. St. Louis enjoyed no finer season in the NHL than 2003-04. Not only did he achieve every hockey player's dream of winning the Stanley Cup, he won both the Art Ross and Hart Trophies to boot. No truer testament to how skilled and integral he was to his team, St. Louis also garnered the respect of his peers in receiving the Ted Lindsay Award (at the time known as the Lester B. Pearson). "I'm so happy to see him where he is, because he's more my size!" quipped Ted Lindsay himself before revealing the award's recipient. "It's amazing when you think that this young man, set all records on his college team, was not drafted. I certainly hope that the scouts in the National Hockey League will take another look. You don't need to be six-foot-two to six-foot-five. You can be five-foot-nine and have a big heart and lots of guts, and have a desire to win. That's what this young man has." With 45 games and 14 points on NHL ice, entering the Hall of Fame in the builder category is the one and only Willie O'Ree. Often referred to as the "Jackie Robinson of Hockey" for becoming the first black player to compete in the NHL, where words fail, a beautiful poem by Ian LeTourneau steps in. on the scoresheet of history. The poem was written as part of a 77-page document from the collective hockey world urging for O'Ree's induction. “For every single kid who was ever told to 'stick to basketball', Willie was like the first man on the moon.” - @Simmonds17 on hockey pioneer, Willie O'Ree, who Simmonds says needs to be in the HHOF – yesterday. For over two decades, O'Ree has been a fixture in the community working towards diversity and inclusion in the world of hockey serving as the NHL's Diversity Ambassador. In 2018, The Willie O'Ree Community Hero Award was introduced to recognize an individual who positively impacts his or her community, culture, or society through the game of hockey. He becomes the third black player to be inducted, joining 2003 inductee Grant Fuhr and 2010 inductee Angela James. Martin Brodeur has emerged as the winner of the EA Sports NHL14 Cover Vote campaign.